So, this is quite a different “review” than the ones we have on our blog. Usually, a food review lasts for a couple of hours then we go back and write the review and we’re done. With La Juiceria, however, I was asked to do a detox programme. In fact, it was a one-day detox deal where I was to drink 6 different bottles of juice the whole day, with no solid food intake. A challenge? You got that right! Well, I took the challenge, because that’s what we do here. One day of no eating? Sounded a little scary to me, but Zalikha from La Juiceria said a lot of their customers often do it, sometimes even once a month. So on a Saturday morning, I woke up, drank a glass of water and started with my first bottle – Goodness Greens. A nice jungle green colours, it was a concoction of kale, spinach, apples, celery and many other green goodies. Alkalizing and cleansing, it was the perfect juice to start the day with, and I was feeling great! After 1.5 hours, I opened up the second bottle. Mint Lemonade – a wonderful mix of lemon, mint, wildflower honey and alkalized water. Definitely milder than the first one, this second bottle was minty and lemon-y, with the right amount of sweetness to it. It apparently helps with digestion, and I noticed that after my second bottle my toilet visit felt a lot (ahem) smoother. The next bottle, Tropical greens, was my halfway point and truth be told, I was getting a little hungry by then. However, I knew this was a mental battle (I love food, can you tell?) and swigged up the gingery juice. By the time I opened my 4th bottle, I noticed some physiological reaction to my half-day of cleansing. I was visiting the ladies’ more (yay!) and happened to experience a headache, but Zalikha assured me that it’s normal and happens to most people going through a cleanse for the first time. Gold Glow, which had turmeric, carrots and orange, tasted slightly spicy to my tongues, though I wonder now if I was craving for some of my mother’s chicken curry and my brain was playing tricks on me. Indians have used turmeric for beauty purposes since time immemorial, so I knew this bottle was full of skin-loving goodness. My fifth and sixth bottles were called Beet Aid and Almond Mylk. To be honest, by this time I was gulping up my bottles, but I have to say this: Beet Aid definitely was tasty! The beetroot taste wasn’t overpowering (to me, at least) and it helped that there were apple and lemon nuances in the juice. As I ended my day with the creamy Almond Mylk, I gave myself a pat on the back for surviving the juice cleanse, with only some water, nuts, dried fruits and tea on the side! 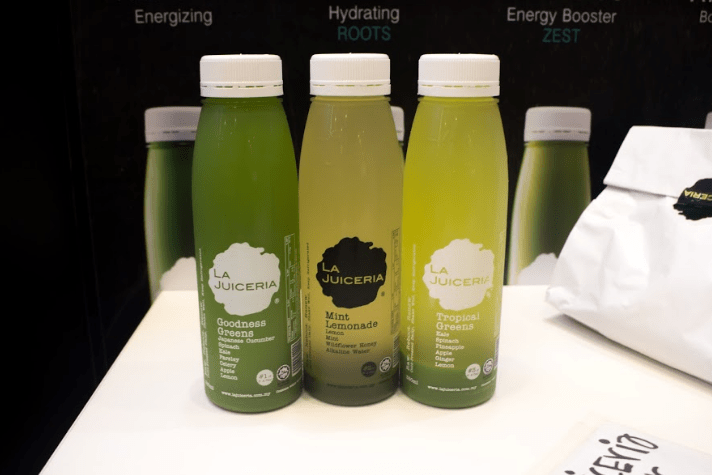 When we had the chance to speak to Anabelle Co-Martinent, the founder of La Juiceria, she told us that it was a documentary that sparked the idea of opening a juice bar in her. With 29 flavours of fruit & vegetable juices in store now, she told us, “If you want it any fresher, you need to juice them yourself.” Hmmm, we think we agree!